Today I am here with a few other ladies to celebrate Lauren from Keep It Sweet Desserts. Lauren is having a baby!! A baby boy! As a mom to a boy, I know how much fun little boys can be. I am super happy for Lauren. She is super sweet and always there to help. 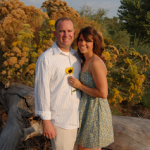 A couple years ago Lauren quit her full time job and opened her own on-line bakery. I have tasted a few of her cookies and brownies. It is no wonder she is so successful, they were amazing! 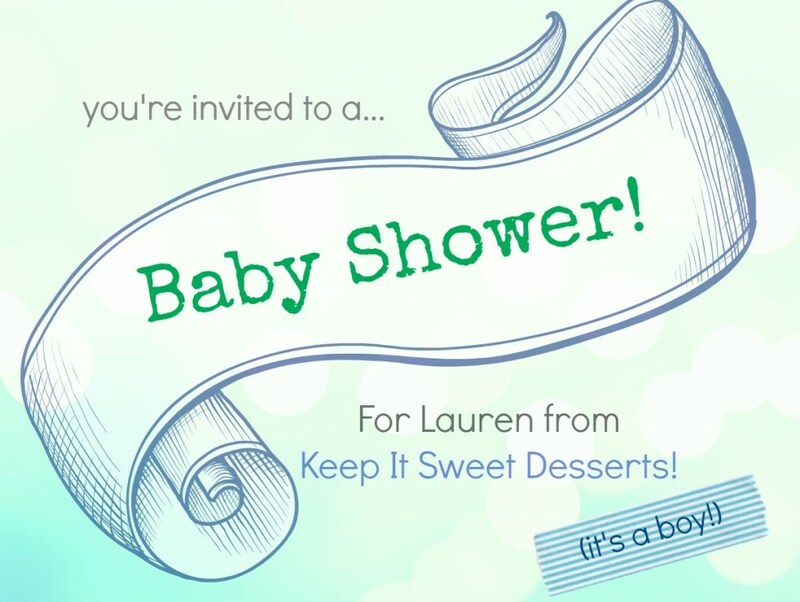 So join me today as we have a virtual baby shower for Lauren. Audra from The Baker Chick planned this virtual baby shower, and thought it would be fitting if everything was mini! Sweet or savory, everything is perfectly cute and mini. 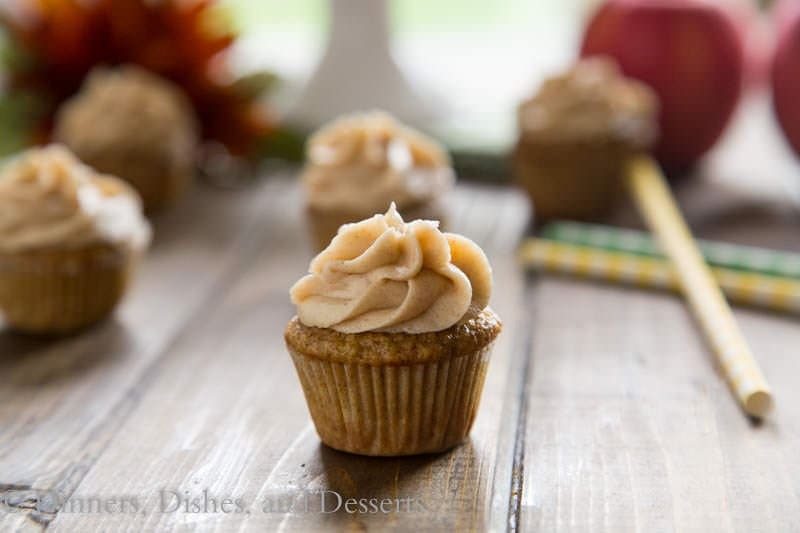 I am slightly obsessed with all things apple lately, so I made these adorable little apple spice cupcakes that I topped with a brown sugar cinnamon frosting. 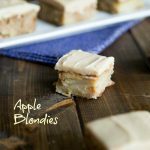 If you have been around for awhile, you might recognize that frosting from these Apple Blondies. 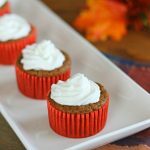 It is just perfect for topping fall desserts. My family doesn’t love apples in desserts. 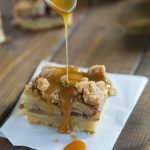 Apple Bars, apple pie, apple crisp etc. They don’t get near them. 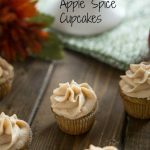 So I was super excited when I made these apple spice cupcakes and they ate them! The apples are shredded, so I know that helped. To be honest, I wasn’t prepared to actually love these. I am a choc-aholic to the core, so I thought I would like these, but that was it. Boy was I wrong! 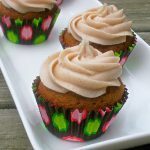 These apple spice cupcakes were so darn good, I could not stay out of them. I am all for mini desserts, because then you don’t have to share. But I used the mini excuse far too much! I quickly sent what was left to work with my husband, and they disappeared very quickly! 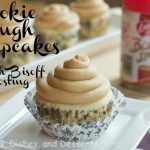 You will definitely want to add these to your baking list this fall! 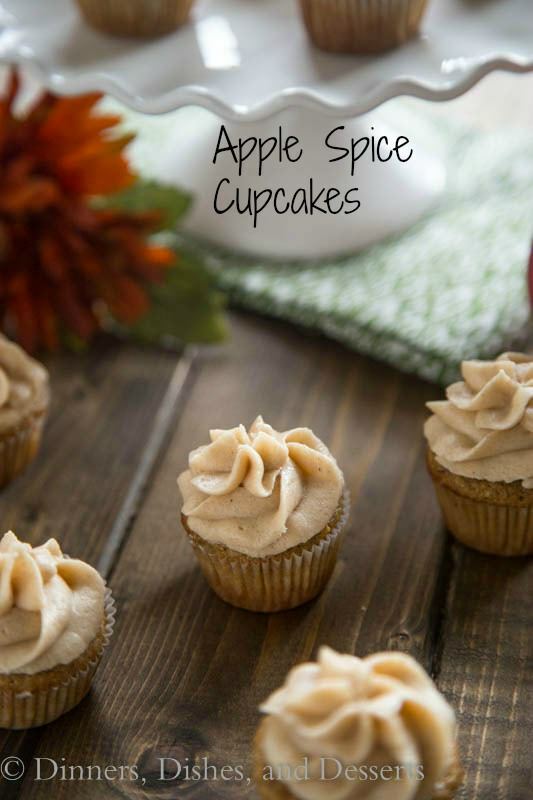 Classic spice cake with apples and topped with a cinnamon brown sugar frosting. Preheat oven to 350 degrees. 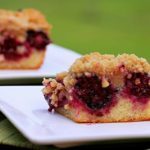 Line a 12 cup muffin tin or 24 cup mini muffin tin with liners. In a bowl combine flour, baking powder, baking soda, cinnamon, cloves, nutmeg and salt. In the bowl of an electric mixer cream together butter and sugar until fluffy. Add in the eggs and vanilla until well combined. Alternate adding the flour mixture and the apple juice until well combined. Fill muffin cups. For mini cupcakes bake for about 12 minutes. For full size cupcakes bake for 18-20 minutes. A tester should come out clean. Meanwhile prepare the frosting. Mix together all of the ingredients until flight and fluffy. Adjust the milk and powdered sugar if necessary to get to the desired texture. Check out the others who celebrating with Lauren today! these cupcakes are over the top CUTE CUTE CUTE! These are so cute I can’t stand it! Perfect for a baby shower! These sound awesome! EEP! These are just the cutest!!! My love for apples knows no bounds lately. These are adorable and sound so perfectly fall!! These are adorable! I would have about 10 of these- thanks for joining in to celebrate Lauren!! So cute! And I adore apple desserts! These are so cute! 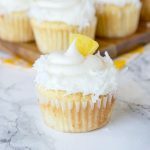 Love the piped frosting! I am ALL about the apple things right now (and always about the mini dessert things ;)). Love these bite-size treats! Gosh I don’t see how your family could resist these little nuggets. They are wonderful. I had two boys and I agree they were/are soooooo fun. I thought I wanted girls, but when I was pregnant with my second child I actually was quite pleased he was a boy. Hey these cupcakes are super cute! 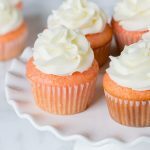 Love your gorgeous piping! Oh, the flavours in these sound amazing! When do the eggs and vanilla go in? Thanks! I have updated the recipe. Sorry about that! Thanks for pointing it out. We just bought some apple donuts at a local farm, I like your recipe much better. 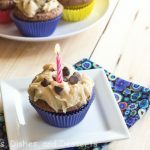 Cinnamon Brown Sugar Frosting sounds AMAZING!! 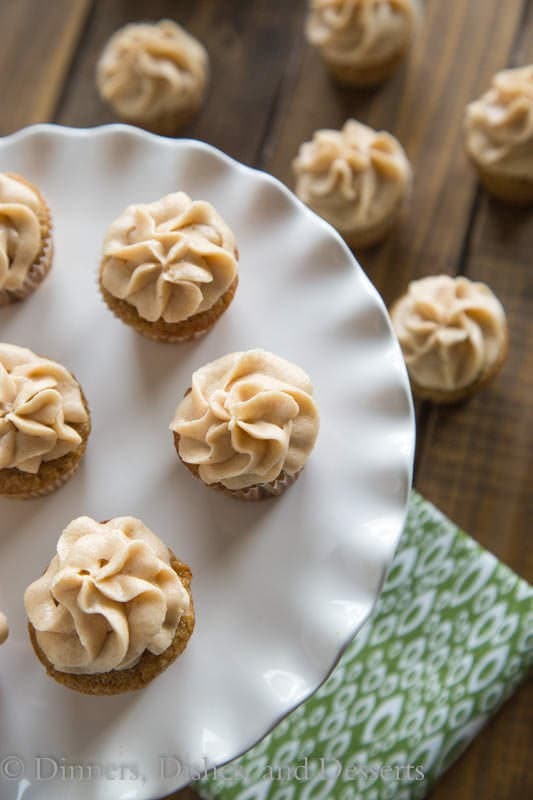 I’m not a big frosting fan, but I’m obsessed with anything cinnamon. 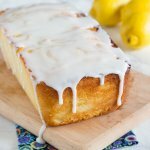 I’ll be keeping this recipe handy next time I’m in need of frosting! Gimme allllll of the cupcakes! 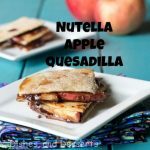 So cute, poppable and they look delish!